Dog Kiss Records have introduced a number of GS Band T-Shirts, on sale at their website (http://www.dogkissrecords.com/). The special edition shirts feature a quality treble clef logo design, along with ‘GS Band’ text. The 3 step ordering process involves selection of shirt, payment via Paypal, then a quick email message with desired size. There are several styles available for both men and women. Dog Kiss Records decided to start the charity fund raiser after 12 members of the Gulf Shore band were injured, at the beginning of the 2017. The invent ‘Annual Mardi Gras Parade’ where 6 middle school, along with 6 high school students were among the injured. A chaotic scene unfolded, resulting in the cancellation of the event. Ambulances rushed to the scene to treat the injured, whilst broken instruments were scattered among-st the debris. It has been confirmed that the accident was caused by the driver suddenly accelerating. Although it’s unsure why this happened, it’s thought that the driver’s intentions were not deliberate. 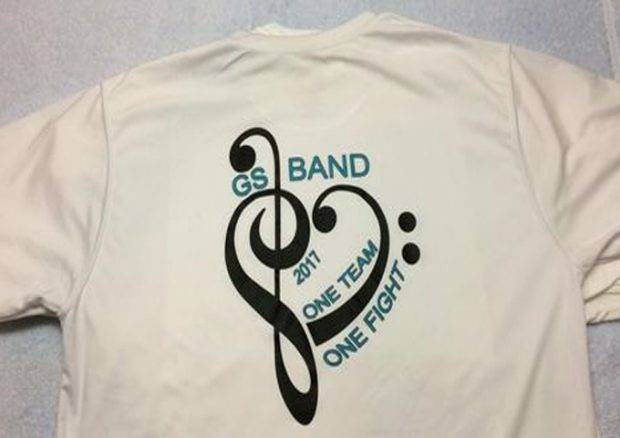 The funds raised towards the school are set to help towards the cost of replacement of instruments damaged at the scene. Its also a way of making the best out of the bad situation. Dog Kiss Records feel they would like to contribute as much as they can. All proceeds raised from the sale of the shirts will be donated to the Gulf Shores School.